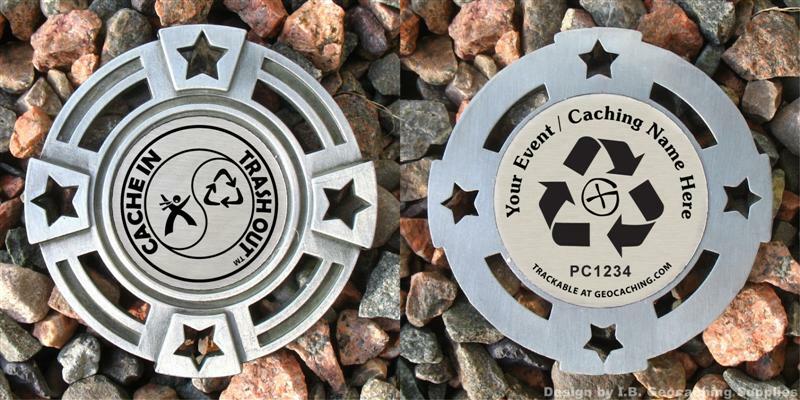 Every year CITO events take place as geocachers clean up parks and natural areas to welcome the return of warm weather. 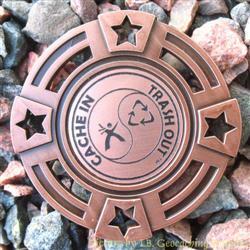 This year there are two CITO weeks, the second being from September 17 to 25. I.B. 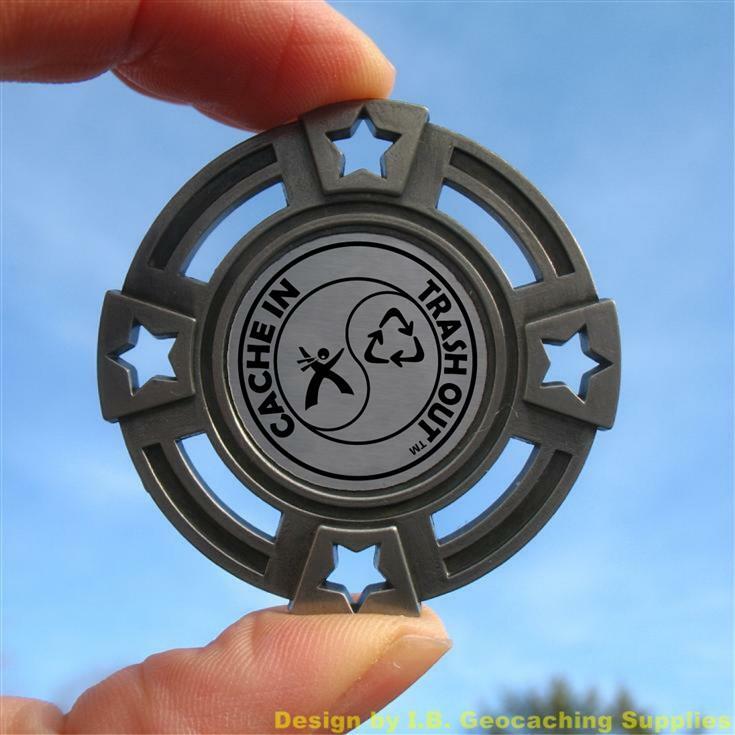 Geocaching Supplies is organizing a Group GeoMedal Geocoin project for geocachers wishing to have a custom trackable for their event or themselves. What is a GeoMedal? 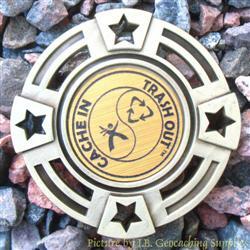 It is a metal trackable like a geocoin, but the design is laser engraved similar to a wooden nickel. 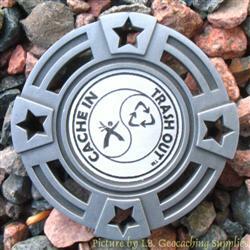 They are typically 2" to 2.5" in size and you can see examples of the GeoMedals we carry in our GeoMedal section. 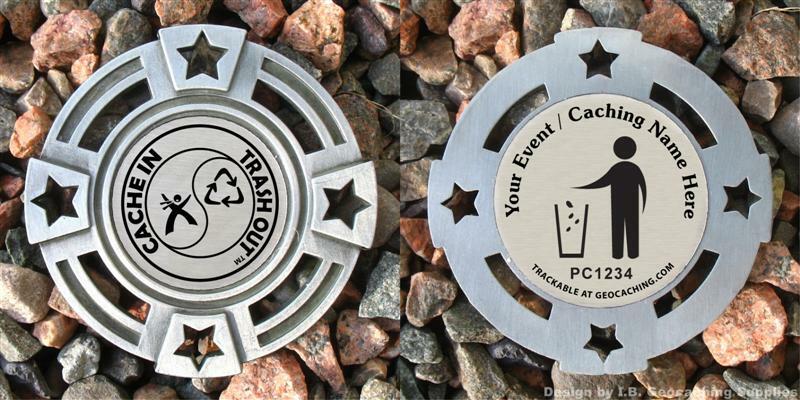 Two designs are available to choose from and the images show mockups of how they will look. Please note these design may be reused in the future if another group project is run. They are 2" in diameter with cutouts around the central circle. The available finish colours are antique gold, antique silver, and antique bronze and any combination of finishes can be ordered. The tracking numbers will have a PC prefix, share a common name (e.g. "CITO 2016 GeoMedal"), and use the generic icon. 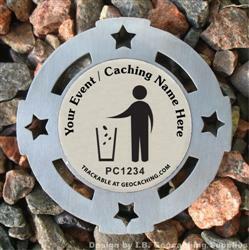 The text "Your Event / Caching Name Here" on the back will be replaced with text of your choosing, be it your geocaching name, event name, or something else. Be sure to specify the text to use in the comments box when ordering, as well as what finish(es) you want. The minimum order size is 5 coins. The pricing table below shows the coin cost for different size orders (which includes the tracking number). You may order any combination of the three finishes; please state how many of each you want in the comments field when you order. Please note that if there are not orders for at least 40 coins the project may be cancelled. 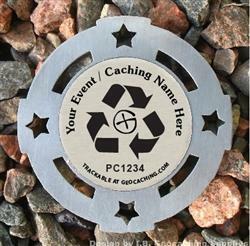 With an order of 50 or more you can choose a custom name for the tracking codes and choose either a PC, CA, or IB prefix. If they are for an event you also have the option of an EV prefix and the event icon instead of the generic one. Shipping cost will depend on the order size and will be estimated in the shopping cart. Orders of 15 coins and under will be sent by regular mail. Orders over 15 coins will require being sent with insurance. August 7: Dealine to participate. August 19: Projected production finish date. August 22: Shipping of coins begins.